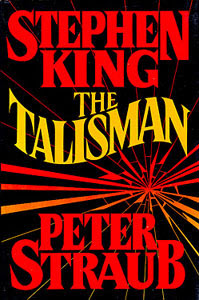 I think I first read The Talisman, by Stephen King and Peter Straub, about twenty years ago. Ever since then, it has been one of my favorite dark fantasy/horror classics, and since that first time I have read it again at least twice. Recently, I took the time to re-read it yet again, savor it, and really think about why this story in particular has withstood the test of time for me. The hero, Jack Sawyer, appears to be a fairly average twelve-year-old boy on the surface, but there is nothing average about Jack. His mother, Lily, is an aging B-movie star who is living out her last days at a remote, seaside hotel. She is also ducking “uncle” Morgan Sloat, the ne’er do well business partner of Jack’s deceased father, who is using Lily’s illness to try to screw Jack out of his rightful inheritance. But the story really starts, and Jack’s life changes forever, when he meets Lester Speedy Parker, an elderly black man who is the handyman at the seaside amusement park located down the beach from the hotel. Speedy calls the boy “ole Travellin Jack” on their first meeting, the same nickname that Jack’s father used to use, and one which aptly describes an ability that Jack has — he can flip between two different worlds, the one familiar to all of us, and another one, the Territories, which is similar to our world, but somehow smaller and bigger, older and younger, all at the same time. The world is a distorted mirror of ours with many individuals in our world having sort of fraternal twins, “twinners”, over there. Jack, though, is only Jack in both worlds, and Speedy gives Jack his mission: to find the Talisman and bring it back so that it can save his mother and her “twinner” — the queen of the Territories. The heart of this story, then, is about a boy who is asked to do too much while too young. Jack has to figure out how to get across the entire United States without being caught by Sloat or any of his minions (from both worlds). He can travel in both worlds, but there are different risks inherent in both, so he is constantly having to negotiate a series of challenges, everything from worrying about hitchhiking to avoiding half-men half-lizard monstrosities. During his journey he meets Wolf, the somewhat friendly werewolf, and the friendship between Jack and this unlikely creature is one of the things that made the most lasting impression on me. Wolf was not made for our world, and there are problems with bringing him over that seriously hamper Jack’s mission. It is the humanness with which Jack faces all of these challenges that makes him a true hero. It is possibly his innocence that allows him to do the unthinkable, a mission that adults would have likely given up on. 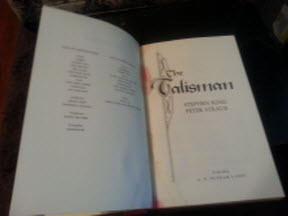 My copy of The Talisman has seen better days. What makes this book stick for me, then, is the story of the struggle and refusal to give up in the face of unbelievable and unrelenting adversity. The bravery to trudge on when the mission seems hopeless, to continue to listen to the small, good voice inside even when not doing so would seem to make things easier. All of the memories of Jack dealing with the horrors and the beauties he encounters along his journey, and his continuing ability to shine in spite of them — these are what make the book worth reading not just once, but over and over again. The most memorable scene for me: the Wolf waiting with the long black car, chauffeuring Jack through the night with “Run Through the Jungle” blaring from the radio. That one image is always crystal clear in my mind, and I look out the huge back window of the car with Jack and see the moon resting large in the sky. That’s the stuff great stories are made of, “right here and now”.